The coordination chemistry of 2-aminopyrimidine (PymNH(2)) with nickel(II) and cobalt(II) nitrate and chloride is reported, including seven new X-ray crystal structures. Two [Ni(NO3)(2)(PymNH(2))(2)(OH2)] isomers were found (A: C2/c, a=13.3006(5), b=7.9727(3), c=28.5453(11), beta=101.758(2), V=2963.48(19), Z=8 and B center dot 1/2 acetone: P2(1)/c, a=7.66060(10), b=10.6792(2), c=20.6790(3), beta=100.2970(10), 1664.48(5), Z=4). In both cases one nitrate is monodentate and the other is chelating and the PymNH(2) ligands coordinate through ring nitrogen atoms. Hydrogen bonding results in double sheet structure for isomer A, and a three dimensional channeled network for isomer B. [Co(NO3)(2)(PymNH(2))(2)(OH2)] (C2/c, a=13.3507(2), b=7.99520(10), c=28.6734(3), beta=102.3540(10), V=2989.77(7), Z=8) is isostructural to Ni isomer A. [CoCl2(PymNH(2))] (Cmcm, a=3.6139(2), b=14.3170(7), c=12.9986(7), V=672.55(6), Z=4) is a sheet coordination network, consisting of corner-sharing chains of Co-2(mu-Cl)(2) bridged by PymNH(2) through ring nitrogen atoms; [CoCl2(PymNH(2))(2)] (C2/c, a=11.2774(6), b=6.5947(4), c=16.5687(9), beta=92.269(3), V=1231.27(12), Z=4) is a tetrahedral molecule knit into a ribbon structures through pairs of hydrogen bonds. Isostructural trans-[NiCl2(PymNH(2))(4)] (C2/c, a=7.67760(10), b=18.7224(3), c=15.0418(2), beta=99.6740(10), V=2131.41(5), Z=4) and trans-[CoCl2(PymNH(2))(4)] (C2/c, a=7.69120(10), b=18.5957(2), c=15.1091(2), beta=99.5280(10), V=2131.14(5), Z=4) are simple octahedral molecules, with hydrogen-bonding producing sheet structures. 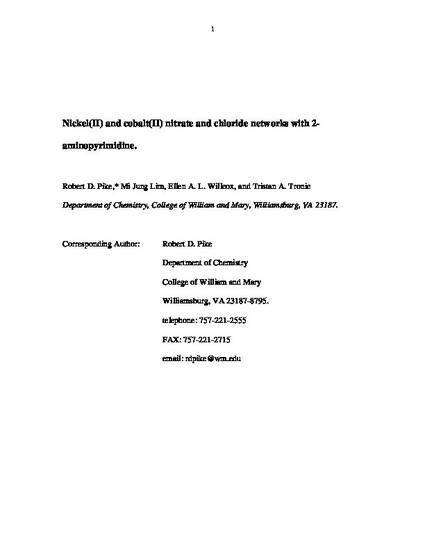 “This is a post-peer-review, pre-copyedit version of an article published in the Journal of Chemical Crystallography. The final authenticated version is available online at: 10.1007/s10870-006-9138-9.